Combine flour, baking powder, 1/2 tsp salt and baking soda in the bottom of a stand mixer bowl fixed with the paddle attachment. Add in cold butter and mix until the butter is the size of peas. Add the parsley and buttermilk and mix until dough pulls completely from the sides. Pour dough onto counter and knead for a couple minutes, then press into the bottom and sides of a 9-inch pie pan. Cover the biscuit dough with tomatoes, and sprinkle with salt, pepper and basil. Mix cheddar and mayo together and spread the mixture on top of the tomatoes. Bake at 375°F for about 20-30 minutes, or until golden brown. Stuff into face. If there’s any type of recipe I love the most, it’s the multi-tasker. You know, the ones that are one thing for dinner tonight and can be made into something totally different for tomorrow’s lunch? Or the ones that can be one thing or another thing, depending on how you need to use them? You see, I love me a biscuit now and again. Honestly, who doesn’t? But sometimes, I don’t need a biscuit – I need pizza dough or a pie crust. Enter this lovely Buttermilk Parsley Biscuit recipe. Biscuit dough is one of the easiest doughs you’ll ever make – in about 10 minutes, you have a cohesive dough, and about 10 minutes after that, you have biscuits. Or pizza dough. Or pie crust. Whatever. It’s that simple, and there’s no catch, save that biscuit dough makes a fine pie crust for this Tomato Pie. 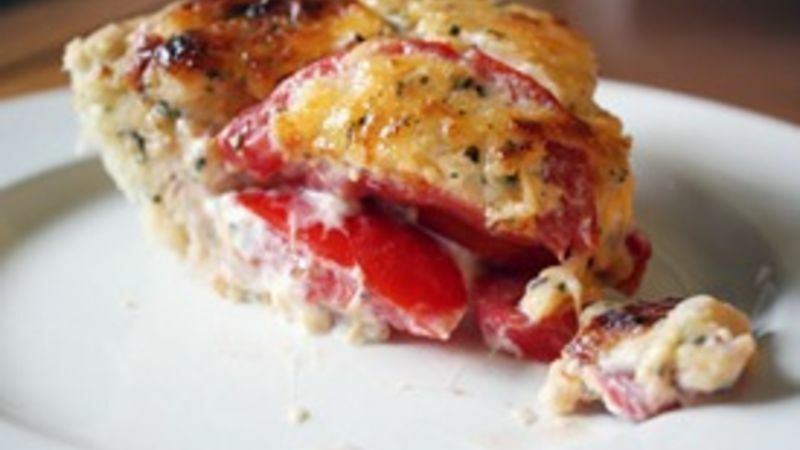 The savory flavor and fluffy texture of the Buttermilk Parsley Biscuits surrounding the sweet, tangy, cheesiness of this wonderful Tomato Pie is an awakening for your taste buds, especially if you’ve never tried tomato pie before. Layers of fresh, ripe, juicy tomatoes topped with a creamy mixture of cheddar cheese and mayonnaise (yes, mayonnaise) atop a bed of buttery biscuit pie crust? Your mouth will be ever thankful you introduced it to this magic. If you’re not a fan of the biscuit pie crust thing, make the Tomato Pie with your own favorite crust. Or, if the whole Tomato Pie thing is too strange for you, make biscuits with the dough. It’s a win-win situation, really. And if you do decide to go all out and make the biscuit crust and the pie, you’ll have a delicious dinner in an hour flat. That, my friends, is a win-win-win. Stephanie (aka Girl versus Dough) has joined Tablespoon to share her adventures in the kitchen. Check out Stephanie’s Tablespoon member profile and keep checking back for her own personal recipes on Tablespoon!